You are here: Home / News / Doug Williams’ comments are representative of how NFL feels about domestic. Doug Williams’ comments are representative of how NFL feels about domestic. (ThyBlackMan.com) Former NFL quarterback Doug Williams will always be in the history books as the first black starting quarterback to win a Super Bowl as he did with Washington in Super Bowl XXII against the Denver Broncos. He now works for Washington as a team executive but he is current in the media circle for comments that he made regarding domestic violence. After Washington acquired former San Francisco 49ers linebacker Reuben Foster, who was released from the 49ers after being arrested and charged with domestic violence allegations against him, Williams said something that really shouldn’t be surprising considering how NFL teams seem to view players accused of domestic violence and how the NFL itself has blundered so many domestic violence situations. During his weekly interview with a sports talk show, Doug Williams responded to the backlash that the team received from signing Foster, who has had domestic violence issues in his past, by saying, “We’ve got people who are in high, high, high, high places that have done far worse, and if you look at it realistically, they’re still up there. This is small potatoes [compared] to a lot of things out there. But at the same time, it’s a big issue in America today, whether or not it’s in football, whether or not it’s in everyday life, whether or not it’s in politics, it’s out there.” Williams has since apologized for his comments. One of the best running backs in the NFL is former Kansas City running back Kareem Hunt. He was one of the best players on a team with real potential to go to the Super Bowl this season. Hunt is no longer employed after video surfaced last week of Hunt getting physical with a woman including shoving and kicking her in February 2018. The team said they released Hunt because “As part of our internal discussions with Kareem, several members of our management team spoke directly to him. Kareem was not truthful in those discussions.” TMZ published the video that led to the Hunt by Kansas City and apparently TMZ has more and better resources than the NFL and Kansas City because neither had seen the video. Even more frustrating is that the NFL never requested an interview with Hunt during their investigation of that incident, which occurred outside his Cleveland residence. Years ago, the NFL’s handling of the Ray Rice domestic violence situation was the NFL’s biggest problem. It was a story that made national news and even Rice himself has weighed in on Kareem Hunt due to similarities of both situations. 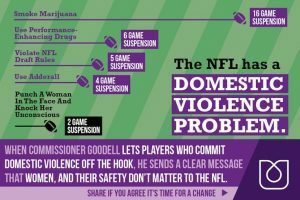 It is just not acceptable that the NFL as a league and NFL teams continue to be reactive regarding domestic violence and not proactive. During the NFL Draft, it is mentioned ad nauseum that NFL teams exhaust numerous resources, private investigators, multiple interviews, and background checks among the research onto the off the field behaviors of the college football hopefuls entering the NFL who are going to be financially invested in. Yet situations like Kareem Hunt happen and NFL teams continue to acquire players with domestic violence allegations or even when it has been proven like the drafting of former Oklahoma Sooner and current Cincinnati Bengals running back Joe Mixon. The truth is that Doug Williams was actually telling the truth about the NFL, the “small potatoes” of domestic violence still earns the privilege of playing in the NFL while it is apparently okay to blackball Colin Kaepernick, the man who started the NFL protesting of police brutality and inequality of black people.